Our media team have years of experience processing 360° content for a variety of outputs, from rail or highways route filming to immersive marketing. Content can be integrated and animated with a wide range of software and media to meet varying needs. Our team use various methods to process footage of routes, stations and access points. We have the ability to output 360° video, annotated with the necessary mileages and chains for ELR, allowing you to quickly search and navigate the immersive content from anywhere on your project. Similarly to rail, the team process linear routes plotted to whatever coordinate system is required. With the addition of other options such as rear view and wing mirror overlays, we can create a visually accurate driving experience. Our team of media experts work with you to create the story and end product that allows you to deliver your message, be it for marketing, safety, training or induction. 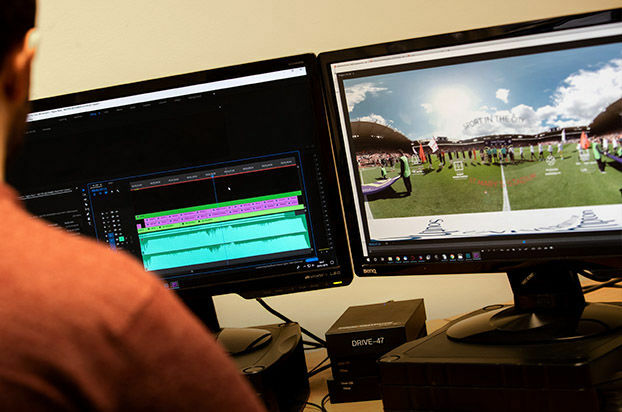 Footage can be edited and animated with music, interviews or graphics and integrated with a variety of software in order to ensure that you have the powerful end result you need. Our team can combine a powerful mixture of videos, stills, infographics and other overlays to enhance both exisiting and new bid presentations.